On my first visit to the Louvre in Paris, I was determined to look at the Mona Lisa in its original form. I was unprepared for the crowds in the Italian Art section of the museum, which were far greater than in any other part of the Louvre. After attaching myself to the longest line of tourists and locals, I finally found myself in the hall where the Mona Lisa was displayed. Other outstanding paintings covered the walls of the hall, some by da Vinci himself, but nobody was even glancing at them. All eyes were on a smallish painting, which had its own red velvet ropes leading up to it, with security guards (the only ones I saw in the entire Louvre) making sure nobody stood at the Mona Lisa for too long, or that nobody photographed it. Now that I have actually seen the Mona Lisa and the other Italian paintings by the great masters, I am – or at least, I think I am – in a position to understand that the most famous painting in the world is just that: it may not be the best, but it is the most famous. What does all this have to do with mangoes, you may ask? Just this: in any conversation about mangoes, the name Alphonso will come up sooner or later. The reason is simple. It may not be the best, the sweetest or the most flavourful, but it is the most famous. Just like the Mona Lisa. Mangifera Indica, the scientific name for the fruit we love so much, is native to India, which is the largest producer of mangoes in the world, accounting for around 57% of the world’s crop. The other countries that produce mangoes include China (Hieun Tsang, the 7th century Chinese traveler reportedly carried a cutting from India to China) and Mexico. Other countries that grow mangoes include the Philippines, Thailand and Indonesia. Very little of the Indian crop of mangoes is exported, because most of it is consumed locally. Mangoes are eaten as a fruit, as a vegetable in its raw form, made into a spice and pickled in large quantities. Though mangoes grow in Bihar, Gujarat, Karnataka, Kerala, Madhya Pradesh, Orissa, Tamil Nadu and West Bengal, the three main states where the crop grows commercially are Andhra Pradesh, Maharashtra and Uttar Pradesh. Because of reasons that have to do with the climate of these three states, mangoes in Andhra Pradesh are the first to ripen, and thus, North India, even Uttar Pradesh itself, gorges itself on mangoes that come from far away. Safedas and sindooris are the very first types of the fruit to make their appearance in street-side stalls, and no matter how hot the weather is, and no matter how many travails summer brings with it, everybody’s mood cheers up immensely at the sight of the golden fruit. It is only around June that the Uttar Pradesh favourites – dussehra, chausa and langda make their way into the market. Alphonsos, also called Hapoos, is just one variety out of over a hundred. It grows in Ratnagiri, in Maharashtra, and an adjoining district called Devgad. The people there have lost no time boasting of the connection between God’s Land (which is what Devgad translates as) and the Alphonso! Just as Darjeeling tea has been granted Geographical Indication status, perhaps now is the time to do the same for the Alphonso, because of the temptation of obfuscating the issue. When you have bought a box of genuine Alphonsos, you can enjoy a sweet, juicy fruit with a well-rounded flavour. But, is it the best fruit in the market? That is a subjective opinion, the result of childhood tastes and fruit plucked at the height of its ripeness, from a good tree in a good year. And quite frankly, there is no answer. How much we love our mangoes can be told by the uses to which we put it. Mango Bite is a fairly popular sweet, Frooty and Maaza are some of the best selling cold drinks in our country. Add to that aam papad, aamchur, mango murabba, mango jam, mango squash and mango pickle, and you haven’t even begun to scratch the surface. What do you gift a favourite relative who lives abroad, if not mangoes? And when you hear that somebody is going to Malihabad or Ratnagiri, what is your first reaction? Most people would begin to salivate at the thought of all those fabulous mangoes. 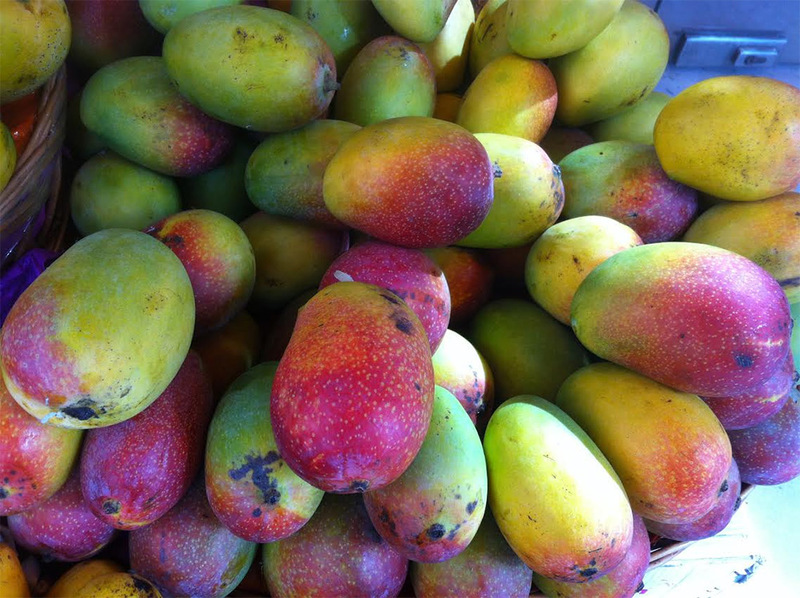 It is not just the taste of ripe or raw mangoes that we love to eat. The significance of the fruit and other parts of the tree go beyond the table. Mango leaves strung up in bunches over a house or shop indicates to the passers-by that a pooja has been conducted there. These mango leaves need to be disposed off carefully, or just left hanging till they turn dry and brittle, so in markets in the more traditional parts of the country, mango leaves suspended from the lintel of shops is a common sight. The paisley design, originally from Persia, is widely thought to symbolize the mango. In fact, Kashmir is one of the states where mangoes do not grow, but the state has its own connection with the fruit: Kashmiri shawls, carpets and paper mache objects are adorned with the paisley. On a lighter note, mango milk shake is the most popular summer cooler in the Valley. In the last decade, Srinagar’s shopping district Lal Chowk has seen the mushrooming of mango milk shake kiosks that do a roaring trade. So, which mango really is the best? Is it even a fair question? Perhaps not. Goans will tell you how Xavierin, Fernandino, Monserrat and Mankorad are far superior in flavour to Alphonsos, while residents of Andhra Pradesh will laugh out loud at the mere suggestion that anybody considers Baiganpalli less than the best mango around. Lucknowites will not deign to join in the conversation. Anything less than the noble produce of Malihabad is not worth even talking about. Connoisseurs, and there are several when it comes to discussing mangoes, make a broad distinction between the fruit of the three principal states. They claim to be able to tell, at a blind tasting, which fruit has come from which state. They postulate that the flavour is all because of the soil. Blindfold a Bengali and give him a Himsagar, and it is likely that he will be able to identify it from a host of other mangoes. What is beyond doubt is the way in which mangoes are used in cooking all over the country. Goa has Caap, (see recipe) an unusual cross between a soup and a curry, whereas the Punjabi version of it is gudumba, and the Uttar Pradesh rendering is mango panna. Gudumba is made by boiling raw mangoes with sugar, black salt, chilli powder and black pepper, and is consumed in order to prevent heat stroke. In the days before mass transportation became a way of life, grandmothers would warn their grandchildren never to pick off mangoes from the tree before Baisakhi, on the 13th of April. Before that date, the fruit was considered far too sour, and contained too much sap, so was guaranteed to give one a sore throat. The sap of the mango tree is, until today, considered strong, and so, when mangoes are bought in the beginning of summer, even the most modern family will soak them in water for a few hours, to “make them less heating to the system”. And that translates as letting the sap dissolve. This procedure is followed until the first rain of the season, when Nature herself washes off the sap from the fruit. Mango panna, like gudumba, is a thick mango drink, and is made to perfection by the Mathur community. Recent efforts to make it commercially have imbued it with a chemical aftertaste. In my opinion, it is worth the trouble and effort to make it, at least once a year at home, because of the danger of forgetting the real taste and mistaking the chemical version for the natural one. Unlike the Thais who not only grow mangoes, but use them in cooking, there is no Indian pairing of mangoes with a non-vegetarian ingredient: in Thailand, raw mango and dried shrimp is a popular salad and rice with fried salted fish and raw mango salad is a popular breakfast dish. In Bengal, on the other hand, tiny dice of raw mango are used to perk up tomato chutney, while in Mumbai, raw mango is used as a souring agent in bhel puri. Ayurveda considers raw mangoes to be immensely cooling to the system, and so they are used in a number of dishes, including as a souring agent for dal in Bengal. On the other side of the country, Gujarat has a thick puree of squeezed ripe mangoes called aamras, that is eaten with puris at breakfast time, in the same manner that shrikhand is eaten in neighbouring Maharashtra. Shrikhand differs from aamras by containing hung curd, so that it is more sour and richer. However, it is in the making of mango pickles that you get the greatest variation from one state to the other. Andhra Pradesh mango pickle is fiery hot, owing to the vast quantities of Guntur chillies that go into the preparation, while Punjabi mango pickle has a strong aftertaste of the mustard oil that is used. Gujarati chhunda is shredded raw mango that has been cooked with sugar syrup so that it becomes like a sweet relish, while Goan water pickle is a rather Spartan quartered raw mangos pickled in brine, and is something of an acquired taste. Bona fide Indian desserts that use mango in them include mango kulfi, but inventive chefs get around that problem by making a concentrated mango sauce called a coulis, and drizzling it on a plate containing pannacotta or indeed, any other dessert, so that the name “mango” can, quite legitimately, appear in the name! It is the same approach to a main course: grill a chicken, or any other meat, and combine it with a mango salsa, or mango dice that have been mixed with jalapenos, curry leaves and mustard seeds, or any other ingredient, whether it is Indian, South East Asian or Western, depending on the result that they want to achieve. That way, it can contain the word mango in its name. Finally, long after the mango season is over, and you want your fix of the golden fruit, what do you do? Quite a lot, thankfully. You can chew on sweet-sour churan that uses aamchur, or enjoy aam papad, a leather-like sheet of dried mango pulp, either black or light golden in colour. And then, you can look forward to next year’s mango crop. Peel the mangoes and slice into three parts each. On a very low fire, simmer the onions, haldi and jira in a tablespoon of oil taking care that the onion does not brown. Add the mangoes, chillies, ginger-garlic paste and salt along with about a cup or a cup and a half of water, and leave to simmer till the mangoes are tender. The amount of water and the cooking time will vary, depending on whether you have used raw mangoes or the semi-ripe ones that are only available in Goa. When all the mangoes are tender, add the coconut milk and heat through, being careful not to let it boil. It has to have equal measures of sweetness and sourness, so you may have to add sugar at this stage if necessary. Serve at room temperature with steamed rice. Peel and cube the mango. Whisk the mango till smooth and creamy, and add the mango, chilly, salt and sugar. Fry the mustard seeds, and as soon as they pop, add the shallot/onion and dry lightly. Add to the yoghurt mixture, and serve at room temperature. Preheat oven to 350 degrees F. Barely melt butter and pour into a 9 x 13 inch baking pan, coating bottom and sides of pan. Whisk together the flour, sugar, salt and baking power in a large bowl. Whisk in milk until well blended. Pour into prepared pan. Arrange fruit on top of batter. Bake 50 minutes, or until batter rises over fruit and is well browned.